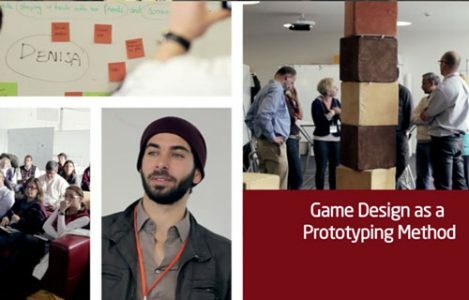 Game Design as Prototyping Method was first featured by the HPI d.Confestival in Sept 2012 @ Hasso-Plattner-Institute, Potsdam and was held at various occasions since. The workshop explored rapid game design as tool for building prototypes in the Design Thinking innovation process. One of the key attitude in Design Thinking is finding the means how make ideas tangible and testable as early as possible in the design process. In the workshop ‘Game Desing as Porotyping Method’ participants were working in teams to tackle an example design challenge. After brainstorming solutions they translated key features of their proposal into game mechanics which provided a unique an immersive way of testing.